Filmmaker, writer and professor Elder’s new book traces the rise of a new scientific theory, which changed our conception of time, space, objecthood and personhood and demanded revolutionary, new art forms. Cubism and Futurism were closely related movements that vied with each other in the economy of renown. Perception, dynamism, and the dynamism of perception—these were the issues that passed back and forth between the two. Cubism and Futurism: Spiritual Machines and the Cinematic Effect shows how movement became, in the traditional visual arts. Further, it explores the role of the cinema in amplifying this interest, by demonstrating that with the advent of the cinema the time was over when an artwork strived to lift experience out the realm of flux and into the realm of the changeless eternal. Cubism, and Futurism: Spiritual Machines and the Cinematic Effect examines the similarities and differences between the two movements’ engagement with the new science of energy and shows that the notion of energy made central to the new artwork by the cinema assumed a spiritual dimension, as the cinema itself came to be seen as a pneumatic machine. Bruce Elder is an award-winning filmmaker who received a Governor-General’s Award in Visual and Media Arts: the citation stated that Elder’s film cycle “The Book of All the Dead, inspired by Dante Alighieri’s Commedia and Ezra Pound’s Cantos, grew out of his preoccupation with the horrors of modernity, its faith in progress and the loss of a sense of what is good and evil. His current film cycle, The Book of Praise, makes extensive use of computer-image generation, highlighting his fascination with mathematics and digital technology. Elder has been a guest lecturer at institutions across North America and around the world and has written books and articles on film, music, poetry and the visual arts. The jury described him as ‘highly innovative,’ ‘influential’ and ‘acutely intelligent,’ noting the enormous span of his practice and the demanding nature of his films.” Elder 7.5-hour long film, Lamentations: A Monument to a Dead World was selected as one of the 150 best Canadian moving image works on the occasion of Canada’s sesquicentennial in 2017. 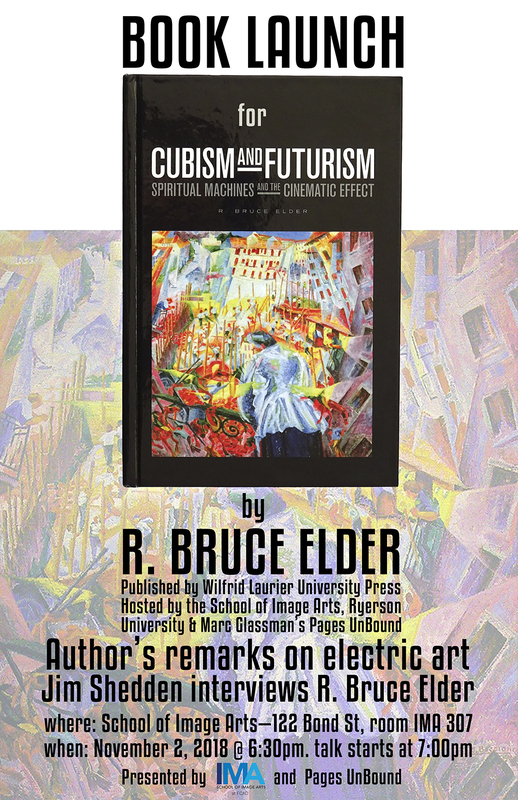 Pages Unbound and Ryerson University’s School of Image Arts are pleased to announce their presentation of a book launch celebrating R. Bruce Elder’s recent Wilfrid Laurier University Press publication Cubism and Futurism: Spiritual Machines and the Cinematic Effect. 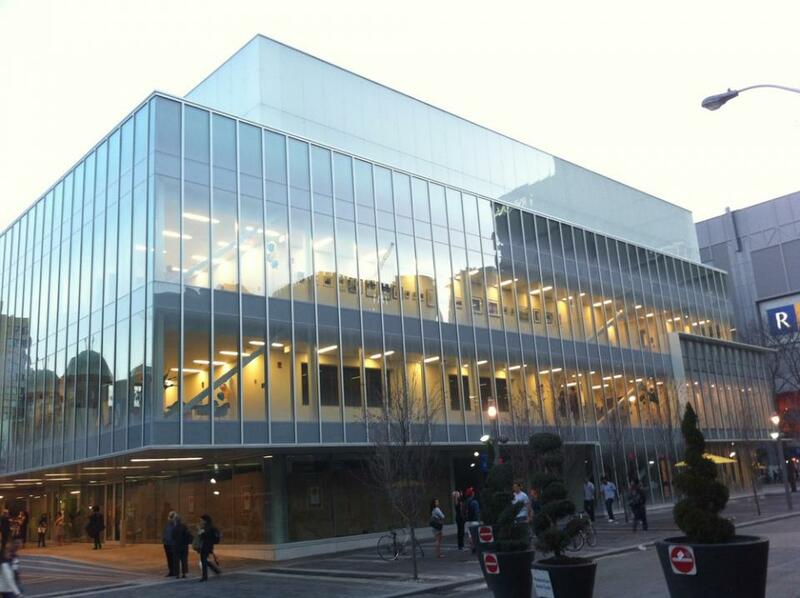 The event will be held on Friday, Nov. 2, 2018, at the School of Image Arts, 122 Bond St., Toronto. Author’s remarks will begin at 7:00 pm and shortly thereafter Elder will be interviewed by Jim Shedden, arts critic, and programmer, and Director of Publications at the Art Gallery of Ontario.